The death toll due to icy road accidents this winter in the United States has hit 400. We have averaged 100 fatalities per month since November, and there is no reason to believe that March will be any different. This leads me to predict that despite March being a 'transition month' with warming temperatures, we may very well reach the 500 mark by the end of the season. Next season, I plan to record seat belt use data, as well as precipitation type data, so as to reinforce these conclusions. To the average person, freezing rain is the deadliest weather hazard in the USA. No other weather phenomena has more propensity for death and destruction than freezing rain - the king of all extreme weather. Not tornadoes, not hurricanes, lightning nor floods. One only has to look at the death rates during freezing precipitation and the damage totals in major ice storms (rivaling hurricanes) to draw that conclusion. 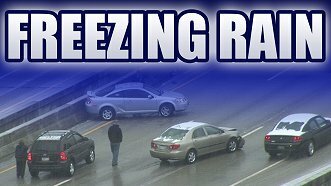 The mere mention of 'Freezing Rain' needs to strike fear in the heart of people just like tornadoes and hurricanes currently do. I hope we'll see a difference made as people begin to realize how much of a threat this underrated killer is. Secondary crashes are a common cause of icy road fatalities, two more of which happened this week. A 'secondary accident' refers to one where the first accident driver exits his vehicle, and then is struck by additional vehicles that lose control in the same location. It is very common for multiple vehicles to lose control on the same icy section of road, which means it is imperative that occupants remain in their vehicles. Standing on or along an icy road makes you a sitting duck. Unless you can safely and quickly get off the road (up a hill, behind a guardrail), you should always stay in your car - it can withstand impacts that your body outside cannot! Heavy, sudden snow squalls caused several major pileups on Indianapolis-area interstates on Tuesday, including a 28+ vehicle accident on I-69 that resulted in at least 2 fatalities. These incidents bring Indiana's already astounding icy road death toll this season up to 47. (Detailed stats here).